There are three deaths a day from epilepsy and the people affected are spread throughout the UK; access to local meetings can be a lifesaver for them while they struggle to understand what happened and why. 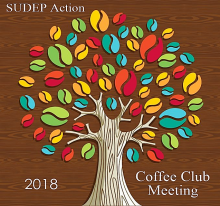 SUDEP Action Coffee Club meetings are in areas all around the UK and throughout the year. People grieve in different ways, even within the same family. It is helpful for bereaved people to have the opportunity to seek out those that they can identify with, who mirror their way of grieving. Being with others who are similar can help to normalise feelings, highlight coping strategies that may help and provide opportunities to access further peer support. These meetings can be a space to swap ideas for fundraising; for raising awareness; for getting through the inquest or to discuss strategies for coping with day to day life, whatever your reasons for meeting up – the main outcome of the meetings is to know you are not alone, that others have been there too. The meetings are usually around 2 hours long, although people may decide to stay longer/leave earlier – it’s entirely up to you. Coffee Clubs are hosted by SUDEP Action supporters who have been bereaved themselves and they will provide you with some up to date information on the charity activities and some resources to take away, but ultimately the time is yours to be with others.